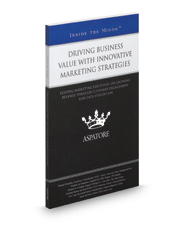 Driving Business Value with Innovative Marketing Strategies provides an authoritative, insider's perspective on establishing best practices that keep pace with the changing landscape, and that help increase customer engagement and drive profitability. Marketing executives from leading companies across the country address key topics such as social media outreach, changing customer expectations, using data analytics, attaining company-wide buy-in, and the importance of growing a brand organically. Covering a range of topics from evaluating new and existing content platforms to differentiating your product, these executives share their insight on the essential elements of a marketing strategy that will help your company stand out from the crowd. Additionally, these authors discuss the challenges of marketing in today's environment, including managing the increased visibility of customer feedback, engaging across multiple platforms with a variety of demographics, and balancing brand evolution with consistency, and offer suggestions for overcoming these difficulties. The different niches represented and the breadth of perspectives presented enable readers to get inside some of the leading marketing minds today, as these top executives offer their thoughts on strategically utilizing new techniques to increase company visibility and value.